When you say "whoa, whoa, whoa-whoa, whoa"
Are you afraid we'll hit the rainbow? When I say "whoa, whoa, whoa-whoa, whoa"
I've basically never uploading any kind of writing to anything ever, but I wrote English lyrics for this awesome song and I figured I may as well learn how to textfile on Inkbunny using it. Butter-Fly was the first single of Kōji Wada (nothing but respect for him, rest in peace), released in 1999. 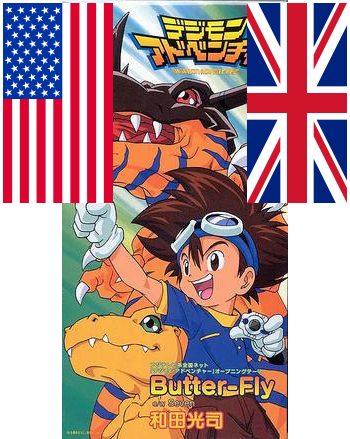 It was used as the ending for the original Digimon Adventure movie, and the opening for the subsequent anime series. I didn't grow up with it as in the 90s and 2000s most kids still just watched the English versions of stuff, but it is still Very Good. When I write new lyrics for an existing song, I try to match the rhythm in my head, but I don't include any markings for what the meter is in the text. Invariably, this means nobody other than me can put the words in the right place in the song. Some day I might put together like, a music sheet or whatever, so that somebody could actually see the proper timing to perform it. P.S. I actually stopped and looked up flag protocol for the proper horizontal orientation of the US and UK flags.